We have picked up our fair share of souvenirs during our travels. 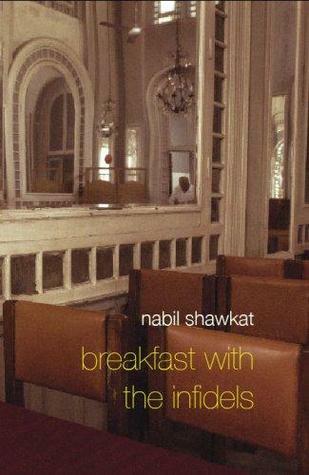 We have probably lined the pockets of some unscrupulous people in many of the countries we have visited. But we like to think we try to buy ethically from local artisans and bazaars. 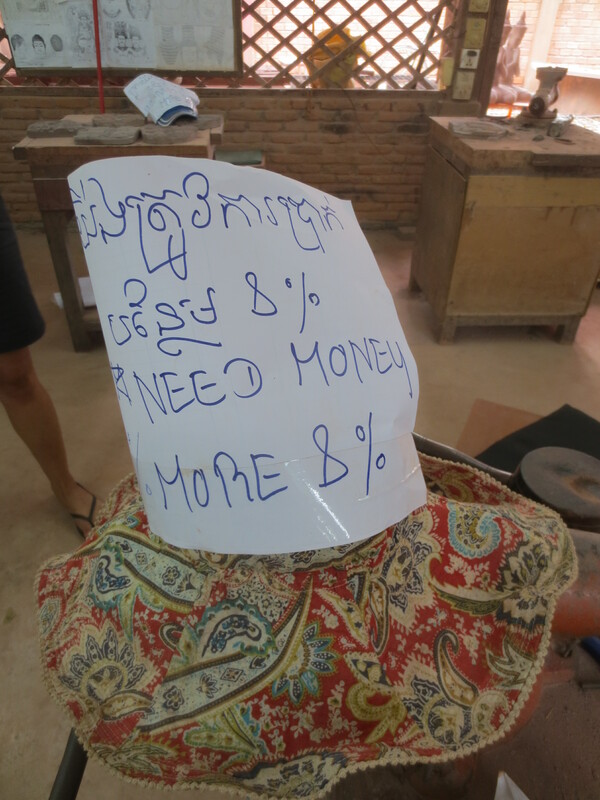 However, everything became a bit confusing recently when we visited the centre of the Angkor Arts and Crafts in Siem Reap. They say that impoverished youngsters are trained in the arts of their ancestors. Bus-loads of tourists were weaving through the workshops taking photographs of the artisan workforce carving beautiful heads of Buddha or Jayavarman. The workforce was silent and did not entertain any requests for dialogue or posing for a photograph. Each worker wore a paper hat, or had a paper message sellotaped to their shirts – both declaring that they needed more money and a pay-rise of 8%. They must be desperate to go to such undignified lengths to be heard. But, none of the tourists seemed remotely interested as they got their shot and headed for the shop. We managed to speak to a worker discreetly about what was going on. Basically, they couldn’t sustain themselves or their families on their present wages and were asking the private owners for an 8% rise in wages. To date, the owners had refused to even enter into negotiations. Very wealthy owners – judging by the cost (and the amount) of goods leaving the factory shop in the bags of tourists – just in the time that we were there. 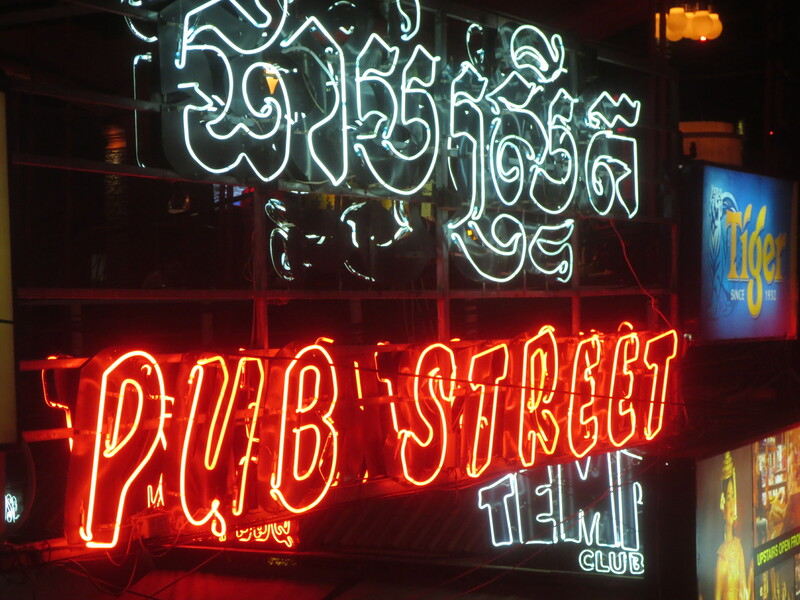 They have outlets at the Blue Pumpkin restaurant in town and out at Angkor Wat too. There was no way we could bring ourselves to buy from the company. 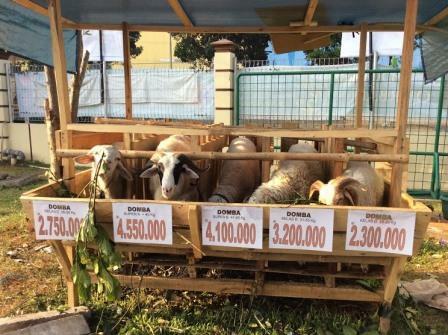 Were we supporting the artisans or making their plight worse by not purchasing their products? But, we did find Mekong Quilts on Sivatha Street. Cotton, linen and silk items made by women from rural areas. Beautiful things. 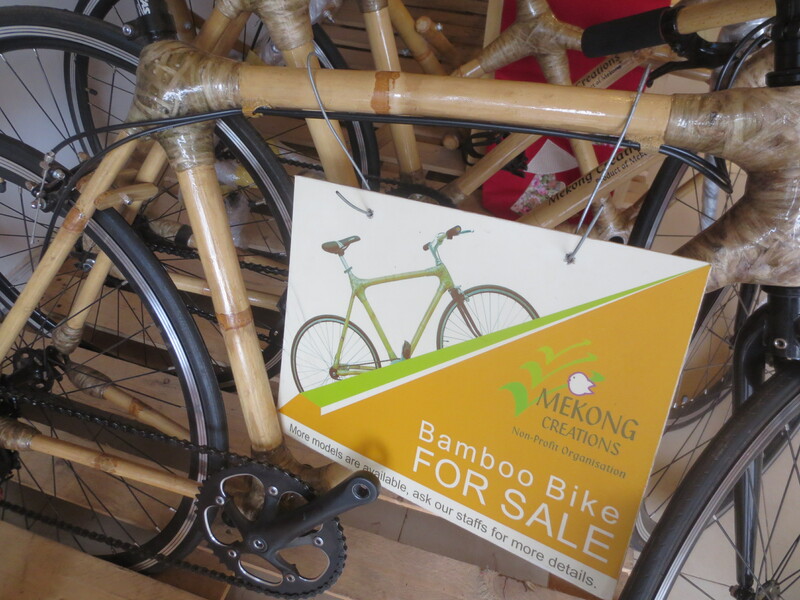 And, selling these cool bamboo-frame bikes. We stayed at a great wee hotel out of town towards Angkor Wat called, Cyclo d’Angkor Boutique Hotel. We hired good quality bikes from them for $7 a day. This would make a great base if running the marathon. It was pleasant to be able to cycle down into the town and the market area and then escape along Charles de Gaulle. 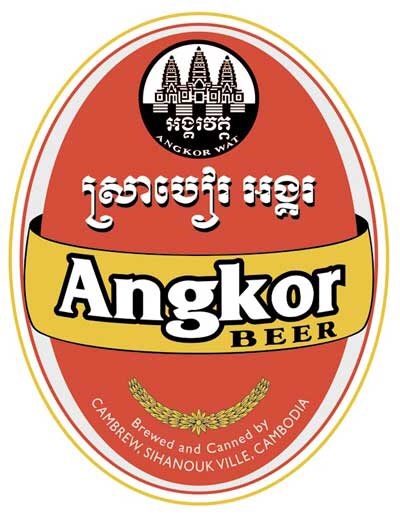 Finally, having tried a multitude of fine (and rank) beers over the last eight years such as Stella, Sakara and Bintang – I think the Cambodian beer, Angkor is my favorite. Delicious, if I remember correctly. This shop makes me smile every time I run past it on a Saturday morning. 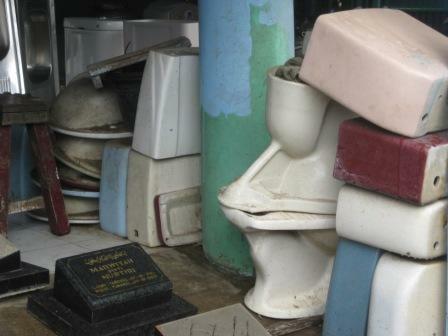 Unusual to find headstones and toilets on display in the same establishment. We cycled to Bintaro Plaza through the Kampung this morning. Thirsty, we tried to buy something to drink in Hero supermarket but the queues were enormous. We succumbed to entering Starbucks. While drinking our overpriced orange juice and designer water we were discussing what we could buy Shona for Christmas. Lucas points to a mug on the shelf and suggests buying it – because it is Christmas and it has Jesus on it. Amazing, the Starbuck’s green siren has even more seductive power than I thought. The date January 25th and the Egyptian colours are being displayed everywhere. Stickers that look like actual car number plates are proudly stuck on vehicles, flags of all sizes fly from homes, bicycles, micro-buses and army tanks. The milk bottle in our fridge displays national unity as does our local supermarket’s carrier bags. Red, white and black stripes are painted on lamposts and tree trunks. 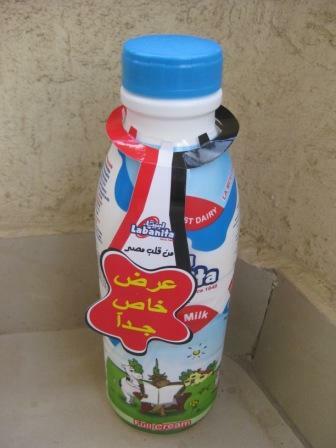 My favourite We Love Egypt promotion at the moment is from the toiletries company Fa. 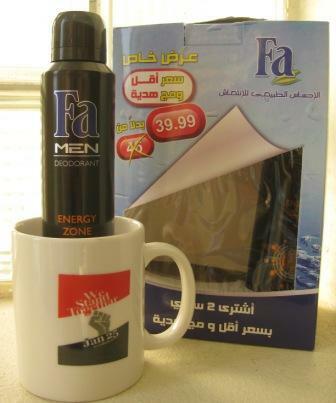 They proudly include a free revolutionary mug (displaying flag and significant date) in a twin pack of deodorant. Also the rather wonderful slogan is written on the mug, We Stand Together. His and hers scent option. So, no excuses while queuing at the polling centre or when the next demonstration happens and you get all hot and sweaty. Genius. We continue to discourage mosquitoes from feeding on us. In our bedrooms we have plug-ins with tablets that we change each evening. The insecticide is very effective although we question what toxins are contained in Ezalo’s magic potion. Recently I was intrigued to open one of the foil wrapped tablets and discover it was a red instead of the usual blue. 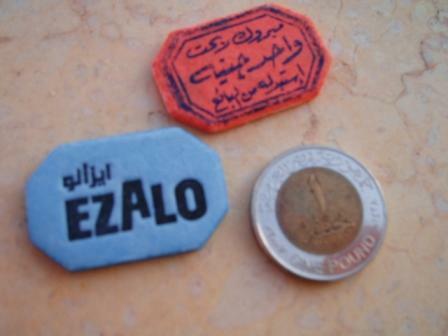 It also had a message in Arabic on one side. My imagination got the better of me. Was this a winning tablet? Was I entitled to a wad of cash or a new Mercedes Benz? A trip to the Ezaro factory? Maybe not. I asked Miss Ghada at work to translate. I was right. I was a winner. Presenting the red tablet back at the shop where I had bought it from ( receipt needed) entitled me to…….. 1LE! I’m keeping the tablet and the story. Me and Charlie.